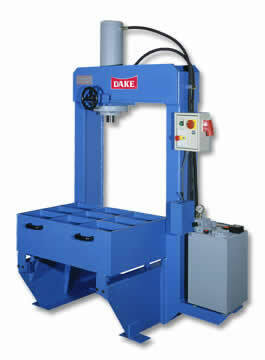 Dake PBM Hydraulic Press is powerful press used for assembly, bending, broaching and other jobs. Models from 40 to 100 ton. Large workpieces easily placed on table and then table moves to center workpiece under cylinder. Table in use – load material from overhead and push table under press great for overhead loads. Table is mounted on rollers so it is easy tp position under ram. 70 to 100 ton models available with manual cylinder lateral movement.